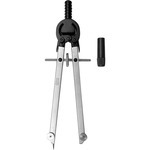 Drafting Compass is precision-crafted from chrome-plated brass and fine tool steel. Instrument is delicately balanced to provide feather-light control. Finish resists tarnish and finger stains.